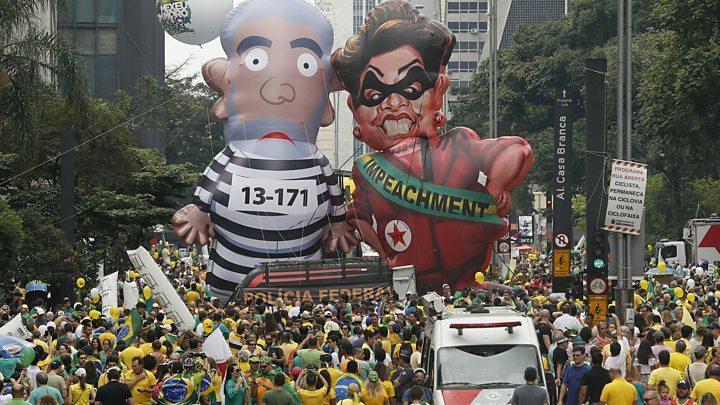 Brazilian President Dilma Rousseff has vowed to fight to "the last minute" despite the desertion of two allies ahead of Sunday's impeachment vote. On Tuesday two parties formerly in her coalition said they would vote in favour of the impeachment motion. If two-thirds of the lower house vote for impeachment, the motion will then pass to the Senate. The Progressive Party (PP), which quit the coalition on Tuesday, says most of its 47 MPs would vote for the impeachment, and the Republican Party (PRB) said its 22 members had been told to vote for it. The move comes weeks after the PMDB, the largest party in the the lower house, voted to leave the coalition. MPs from Ms Rousseff's own Workers' Party are said to be increasingly despondent about Sunday's vote. The allegations, which Ms Rousseff denies, are that she juggled the accounts to make her government's economic performance appear better than it was ahead of her election campaign two years ago. The president's supporters say the issue is not valid grounds for impeachment anyway. While Tuesday's developments have weakened Ms Rousseff's position ahead of the impeachment vote, its outcome is uncertain, with many members of the lower house still undecided. In an interview on Wednesday the president said she would fight the impeachment proceedings "until the last minute of the second half", employing a metaphor from the world of football. On Tuesday Ms Rousseff seemed to suggest that her Vice-President, Michel Temer, was one of the ringleaders of the "coup" attempt against her. She said a widely distributed audio message of Mr Temer appearing to accept replacing her as president, was evidence of the conspiracy. However, she did not identify him by name. MPs are due to start debating on Friday, officials said, with voting beginning on Sunday at about 14:00 (17:00 GMT). The result should be known later in the evening. If the president and Mr Temer were both suspended from office, the next in line to assume the presidency would be lower house speaker Eduardo Mr Cunha. From billions being stolen from state oil giant Petrobras by private construction firms and politicians, to a powerful senator negotiating for a key witness to flee from jail, the country has been rife with jaw-dropping corruption revelations. 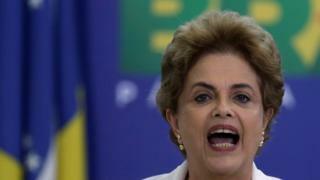 Yet with all the investigations, one person has managed to keep a fairly clean record - President Dilma Rousseff. Ms Rousseff's personal record on corruption may be untarnished so far - but her handling of the economy has been highly controversial. And this is the argument the opposition has been advancing to get her impeached. Making what critics say are bad decisions on the economy is not a crime. But one of the measures taken by Ms Rousseff and her team back in 2014 was deemed illegal by a federal court.